How Much Does an Office Move Cost? Office moves require much more planning and preparation than your average move, and they will often cost much more. Moving your business involves more than your typical packing, wrapping, and moving costs – it also includes the expenses of relocating your employees, the logistics of the relocation and the revenue sacrificed when you shut down operations for a short period of time. While no two moves are the same and it’s difficult to pinpoint an exact cost for your office move, read on to learn about how you can calculate the cost of your office move. It’s the little things that add up after a while, so planning and preparing can help you gain a clear picture of what your business relocation will cost you. Creating a budget: Track all of your planned expenses and keep everything organized in one place, so you can refer to it whenever necessary. Make sure to take into account every cost associated with your move, such as modifications or renovations necessary at your new office location, any deposits or fees needed for the office space, as well as any pre-move expenses like fees you for closing or transferring internet/phone accounts. Taking inventory of your property: In a large office space, it’s not easy to keep track of all the equipment you have when you are preparing for a move. By creating an inventory and cataloging your goods, you can prevent any employee theft and track any items that become lost or damaged. An inventory will also help you obtain an estimate from a moving company. Hiring movers and planning the logistics: The largest portion of your moving expenses will come from hiring a moving company and paying for any necessary packing supplies. Your best bet is to hire a mover that specializes in office relocations and negotiate for one flat rate. By doing this, you’ll have a much clearer picture of what you can expect to pay come moving day and you’ll be able to plan the rest of your budget accordingly. To save on packing supplies, contact your office supply vendors and inquire about obtaining supplies from them. As a regular customer, you may receive a discounted price if you buy in bulk. moving day draws nearer, you’ll encounter more moving-related expenses you’ll have to accommodate in your budget. Moving day expenses: Don’t forget about common office moving costs like having your computer systems and phones shut down, extra fees charged by your moving company (stair carries, long carries, moving heavy pieces of equipment and furniture), paying for the movers to set up your furniture in the new office and the cost of reinstalling your technology systems. Paying for insurance: During an office move you’ll be moving a lot of expensive furniture and equipment, so it’s a good idea to check your insurance policy and purchase moving insurance. When it comes to protecting your business, there’s no such thing as too much insurance—however, protecting yourself does come at a cost. This expense must be factored into your moving budget as well. Estimating your revenue loss: If you’re a large company that can handle normal, everyday business operations while the move is going on, then you shouldn’t anticipate a significant revenue loss during the move. However, most companies will have to shut down operations for at least the time it takes to relocate from your old office space to the new one. 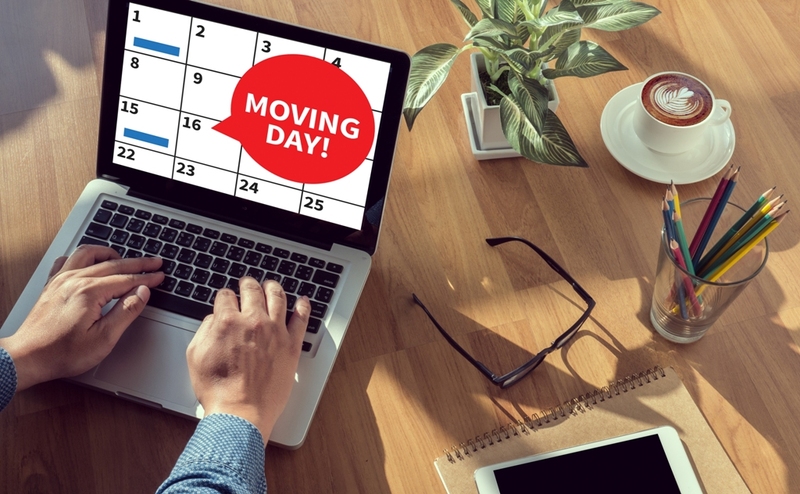 Announcing your move: You’ll have to inform your customers, vendors and associates of your business’s impending move. These communications–whether they’re mailed out via postcard or flyer or sent in mass email blasts, ads and press releases–will cost you money.